NEW YORK, NY / ACCESSWIRE / September 30, 2015 / New results shown at last week's European Cancer Congress (ECC) supported evidence that RX-3117 and Supinoxin, developed by Rexahn Pharmaceuticals, Inc. (NYSE MKT:RNN), work well in humans - a big step up from preclinical data in mice. Phase Ib studies conducted the past year where safety and tolerance were observed mirrored animal trials, but the best news is efficacy in people, confirming Rexahn's theory that its drugs' mechanisms of action pinpoint crucial biological pathways in cancer progression. Cancer-ridding programs at Rexahn, three in total in human trials, have a common goal: targeting tumors at a molecular level. Essential to this goal is tumor shrinkage or dealing a death blow through apoptosis, known as programmed cell death. Targeted cancer therapy has been applauded by oncologist researchers for its ability to potentially enhance efficacy and reduce bad side effects. Until Rexahn's compounds, success has been spotty. More on that later. Supinoxin and RX-3117 were previously tested in mice and results shown at two top cancer meetings last spring. Data strongly suggested the ability to prevent metastasis in certain cancer cell lines with no adverse events, setting the stage for human trials. At ECC, Rexahn fulfilled its promise that Supinoxin works and is well tolerated: use of the drug alone stopped cancer cold in 13% of patients for over one year. Researchers involved in the Phase 1b study demonstrated belief that Rexahn discovered a new pathway key in cancer cell growth and dispersal, and that its ingenuity would be invaluable to treat this insidious disease. Previously named RX-5902 and trademarked Supinoxin, it inhibits p-p68 RNA helicase, an enzyme working genetically to stop excessive cancer cell growth leading to solid tumor shrinkage, with preclinical activity in over a dozen cell lines. Years earlier, p-p68 was associated with abnormal cell proliferation and the spread of neoplastic disease. 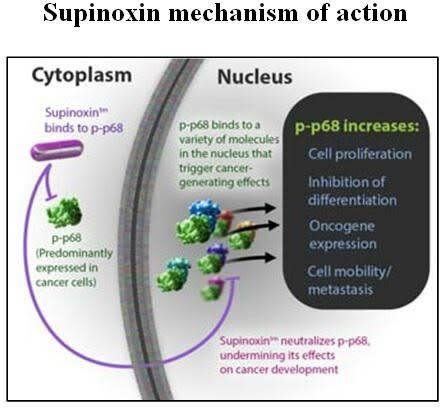 Rexahn's results repeat this research, lending strong testimony to Supinoxin's mechanism of action against cancer. Researchers were also encouraged by Supinoxin's ability to exert its positive action and leave the body with sustained therapeutic success and no bad side effects - termed a pharmacokinetic profile - pointing to a good outcome of any oral medication. A call for more trials at a higher dose was recommended. In another breakthrough moment for Rexahn's oral drugs, efficacy in solid tumors using RX-3117 was found in Phase Ib and presented at ECC. The drug was, like Supinoxin, shown to be safe, tolerable, and had good pharmacokinetic findings. RX-3117 is a bioequivalent of cytidine (a biological component of our body's RNA) that aims attacks at tumors through DNA synthesis to disrupt the metabolism of cancer and cause its demise. In the Phase Ib trial using RX-3117, there was evidence of tumor reduction and stability of disease that lasted 276 days. With anti-tumor action clearly noted, more trials are planned. An important point, data built up over time and continuation of good results could prompt interest in Rexahn's drugs in gemcitabine-resistant cancers. 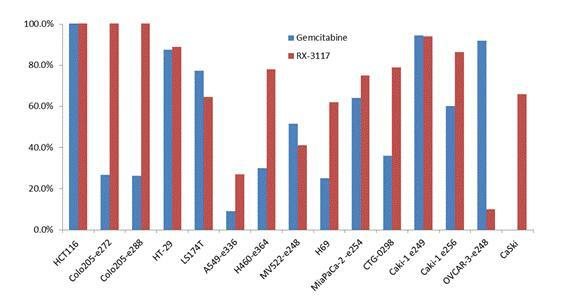 Rexahn was granted Orphan Drug status for RX-3117 in pancreatic cancer when preclinical study researchers published results showing RX-3117 has anti-tumor power over gemcitabine (see graph below), once marketed as Gemzar and created by Eli Lilly & Co. (NYSE:LLY) before going generic. Gemcitabine is widely used in pancreatic cancer but with problems - up to 40% of patients develop resistance within one month and side effects can be severe, such as trouble breathing and swallowing, rash, fever, and blisters around the mouth. Of those resistant, alternatives are few because cancer becomes aggressive and harder to treat after exposure to gemcitabine. Fulfirinox, an acronym for four chemotherapies, has been recommended despite great toxicity that works in a small percentage of patients and may cause peripheral nerve damage. Rexahn has not announced pancreatic cancer the target for either of its drugs, but past efforts in this disease and achievement of a coveted FDA designation lead me to believe this cancer indication will reap the first benefits of RX-3117's healing properties. Both Phase Ib trials concluded with a recommendation to continue testing solid tumor patients at more frequent dosages until a maximum tolerated dose is found. So far, adverse side effects are mild - fatigue, stomach upset, and thirst. Concerning competition, from past conversations Dr. Suzdak and I agree that certain forms of immunotherapy like PD-1 inhibitors and CAR-T cell therapy, for all their fanfare, are not scalable from a manufacturing standpoint; they must be customized per patient, causing the FDA trouble when blessing a plant with Good Manufacturing Practices (GMP) necessary to produce product for future clinical trials. Reimbursement could be problematic for coding procedures. Despite their popularity, only a fraction of patients respond. Side effects are not, in many cases, unlike standard chemotherapy with added risks of rapid and unexpected drops in blood pressure and organ inflammation. Targeted therapies come in different guises, the more well-known and widely used include Herceptin for breast cancer, Erbitux for colorectal and lung cancer, Avastin for kidney cancer, Nexavar for liver cancer, and Tarceva for non-small cell lung cancer. Though scientists expected targeted drugs to be less toxic than traditional chemotherapy because cancer cells are more dependent on their targets than normal cells, the opposite is often true. Side effects are nasty: In general, blood clots develop and wounds heal much slower. Hepatitis is common. Dermatological problems abound - acne-like rash, excessive dryness of skin and graying of hair. Herceptin can damage the heart. Erbitux causes swelling and cracks in skin. Avastin may lead to convulsions. Nexavar has been associated with hepatitis and bowel perforation. Patients on Tarceva may experience stabbing chest pains and the inability to speak. Despite these drawbacks, the market for oncology drugs worldwide is expected to reach $111.9 billion in 2020, with targeted therapies dominating. Oncology medicine is ripe for a new answer, combining all the benefits of targeted cancer therapy like blocking progress of cancer from interference with tumor growth without fear of killing patients, as has been the case with Herceptin, made by Roche Holding AG (OTCQX: RHHBY) with a death count of 260 people or Avastin, another potentially dangerous offering by Roche that carries a 50% higher risk of death than using standard chemotherapy alone. Oncologists should welcome Rexahn's drugs with their limited side effect profile and, as preliminary data shows, effectiveness. Specific risks to an investment in Rexahn fall into the category of any targeted cancer therapy: cancer cells may develop resistance through mutation or find a new biochemical pathway to propagate tumor growth. A larger number of subjects could begin to show the onerous side effects seen with current targeted therapies. Phase 1b trials for RX-3117 and Supinoxin had a limited number of patients where results may not translate to later, bigger studies. Higher dosing of Supinoxin and RX-3117 may not produce desired effects and more adverse side effects may be seen, making Rexahn's drugs not much better than existing targeted therapies or chemotherapy. Given a cash position of $25.9 million as of 2Q2015 (ended June 30) plus an annualized burn rate of approximately $19 million and bigger clinical trials coming if smaller ones are successful, Rexahn will need to return to the market for further funding. As with most small-capitalization stocks, Rexahn may not actively trade or generate sufficient news flow, although its developing clinical programs should produce plenty of press. Competition, especially with immunotherapies, is strong and building, and may yield more positive results than those hindering this drug class in the past. Rexahn's non-toxic targeted tumor therapy with strong results should capture investor attention, particularly those looking to diversity past various overvalued immunotherapies and trumped-up targeted cancer drugs. Rexahn's data has been viewed by thousands of ECC participants, from scientists to hopeful corporate partners. It's time to see that Rexahn's low valuation, in light of huge potential, makes it a bargain at current prices.